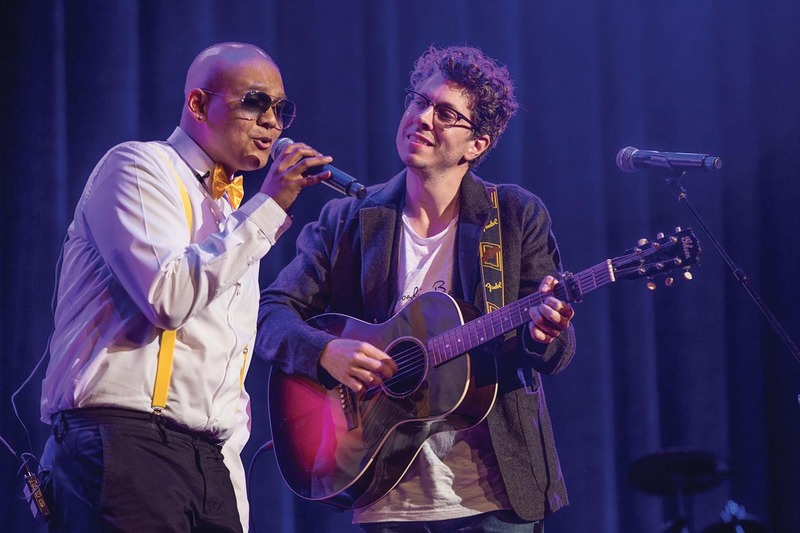 When 17-year-old Ray Cruz was invited to perform at the Ryman Auditorium, he agreed to do it under one condition — that his doctor would perform alongside him. Radiation oncologist Mark Stavas, MD, and Cruz, a patient at Monroe Carell Jr. Children’s Hospital at Vanderbilt, received a standing ovation after their July 18, 2017, Ryman Auditorium performance at the Music City Harmonies for Hope concert, a cancer benefit presented by the Franklin Brentwood Arts Academy and Allegro Music Dance Academy. It was Ray’s cancer diagnosis that brought the two of them together, but it was their mutual love of music that allowed them to form a bond that transcends the disease they are both working to fight. In December 2016, Ray was experiencing severe hip pain, which he attributed to his time spent playing basketball on a team he and his dad started with some of his friends. When the pain intensified, his parents took him to a local emergency department before being transferred to Children’s Hospital, where his family was given the news that the pain in Ray’s hip was caused by a metastatic deposit of cancer in his pelvis. On Jan. 29, 2017 — his father’s birthday — Ray was diagnosed with stage 4 Ewing-like Sarcoma. Ewing-like Sarcoma is an exceedingly rare diagnosis, similar to but lacking the exact characteristics of its more common counterpart, Ewing Sarcoma. The incidence of Ewing-like Sarcoma is thought to affect only a few children in the United States each year. Patients are typically treated with Ewing Sarcoma protocols given their similar morphology. The Cruz family was told that, without treatment, Ray might only have weeks to live. The junior at Centennial High School in Franklin, Tennessee, began his spring semester with a one-month stay at Children’s Hospital with aggressive chemotherapy, followed by targeted radiation to the lung, where his cancer originated, followed by several more weeks of chemotherapy. It was through radiation that Ray met Stavas, assistant professor of Radiation Oncology and director of Pediatric and Palliative Radiation Services. Ray says he immediately felt a connection with Stavas because of his style and candor. Stavas then asked Ray where he finds his strength, what matters most to him and what his hopes are. The conversation that ensued illustrated Ray’s reliance on his faith, his love for his close-knit family and his passion for singing. A musician himself, Stavas shared with Ray that he also turns to music for strength. “Music is where I turn when I’m down or when I can’t do anything more for a patient. Art is a way of understanding the world when you are out of things to say,” said Stavas, who sings and plays guitar and piano. “We jammed on those ideas and he really liked that creative approach. I left doctoring at the door for a while. Of course, I’m going to do everything I can for him medically, scientifically and technologically, but what Ray needed to hear more than anything is that I’m here for him no matter what happens,” Stavas said. From that moment on, music was part of the conversation at all of Ray’s appointments. The message of the song resonated with Ray, and not only did he discover he liked folk music, but he found his new voice by singing the softer, storytelling genre. When Ray was asked to perform at the Ryman, he knew that “Brand New Day” was the song he would sing, and he asked Stavas to accompany him. They began practicing after Ray’s daily radiation treatments in a conference room at the Radiation Oncology Clinic and arranged their own version of the song for their performance at the Ryman. Ray finished his treatment in September 2017 and will have ongoing follow-up scans to determine if additional treatment is needed. While he and Stavas hope that no more radiation is needed, they are eager to find more opportunities to play music together. Ray hopes to use his music to inspire others who are going through difficult times. His goal is to someday start an organization that supports people with cancer. “When I got diagnosed, I knew my family was going to be right by my side, but not everyone has the support I have from my family and friends and the community, so I hope I can give back someday and help others battling this disease,” Ray said.